I am far from being a nutritionist but I have been very interested in the subject and try to learn as much as I can, especially after being a chief cook on board a vegan ship and therefore becoming responsible for not only my own health but the nutrition of all the crew! All fruits and veggies contain phytonutrients, which are plant compounds that work to improve your health. It seems many people have forgotten that that is what food is for! To restore, repair, energise and replenish your body with all the nutrients and minerals that it needs to keep it going. And each colour food contains different essentials that your body needs. Its a pretty easy way to help ensure your eating a balanced diet. So step away from the beige and eat some rainbows!! Green foods are loaded with lutein, zeaxanthin and carotenoids which help lower risk of eye disease, heart disease and skin cancer. They also contain energy boosting folate and lots of potassium. They are high in isothiocyanates which get enzymes working in your liver to help rid the body of carcinogenic compounds. Greens also help to rejuvenate muscles, bones and strenghten your teeth. Clever little greens! Orange foods contain lots of carotenoids like beta-carotene which helps to boost your immune system, vitamin C and bioflavonoids. Orange food increase skin, eye and heart health and help decrease risk of cancer. ORANGES are high in vitamin A and C, magnesium and fiber. Red foods contain the powerful antioxidant lycopene which gives the food that red colour, and anthocyanins. They can help to lower the risk for heart disease and stroke, improve memory and circulation. BEETROOT are high in fibre, vitamins A, C and K, help improve digestion, inflammation and reduce risk of heart disease. Beetroot juice is a brilliant blood cleanser. Blue and purple foods contain high levels of the antioxidant anthocyanin, are anti ageing and help with circulation. 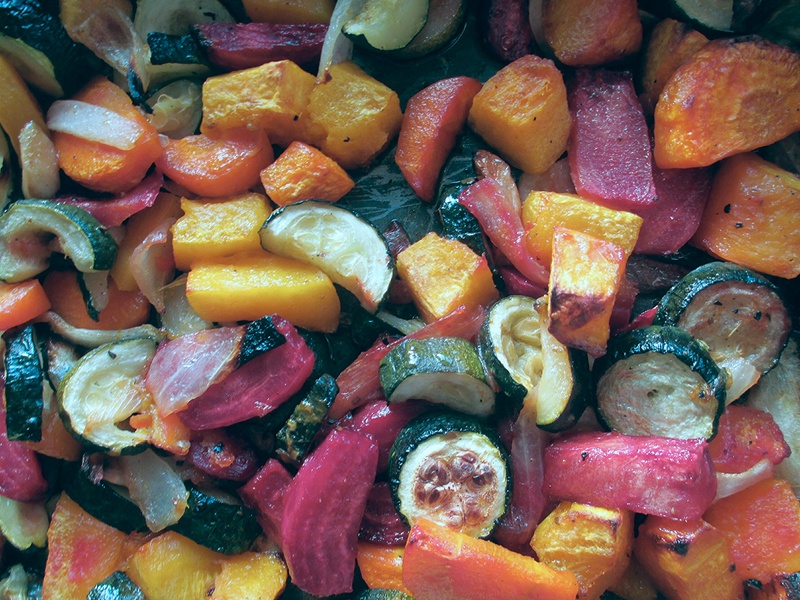 So with all this colour on my mind I thought I would post this recipe for roasted rainbow vegetables. Its makes my mouth water just looking at all those colours, and makes a tasty and easy side dish, thats more than just good to look at. Preheat the oven to 200°c. Slice the onion quite thickly and squash the garlic with the flat of your knife. Chop the rest of the vegetables to approximately 1 – 1 1/2 inch cubes, and placce everything in a deep sided baking tray. Whisk up the dressing ingredients and pour over the vegetables. Mix up to ensure everything is well coated. Cook for 40 minutes, until vegetables are cooked and crispy.